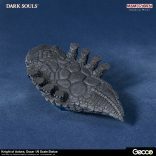 Are you a Dark Souls fan with a lot of disposable income? 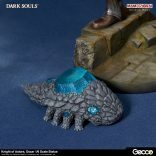 Because this new Dark Souls statue is pretty great. 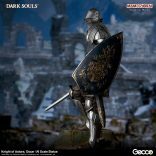 The Dark Souls Knight of Astora, Oscar 1/6th scale statue depicts the very first character you meet in Dark Souls – he’s the one who drops the corpse carrying the dungeon cell key into your cell. He promptly dies soon after, of course, but now he lives on forever in this statue from the amazingly talented artists at Mamegyorai (link in Japanese). Isn’t it good to see Oscar alive and well again? This version of him is only 32cm tall, but he’s looking well. The good folks at Siliconera have translated some of the information on the page: the statue is due in December, and carries a price tag of 34,960. That works out to about $320/£247/AU$404, plus shipping. That’s a lot, of course, but if you preorder you also get this lovely Crystal Lizard, which won’t run and burrow away if you approach it. You have a while to preorder, but if you – like me – can’t afford something this opulent, the website at least has lots of photos from every angle for you to take in and enjoy.